The first time I tried to make sweet potatoes, I made chips. I did not know what I was doing. The slices where unseasoned, too thick, and raw. I felt awful when my good friend Sabby spit it out, after she spit out my roasted eggplant. My sweet potatoes were a far cry from my mamas decadent syrupy camotes con leche. Fast forward ten years and I can say that I have successfully worked with sweet potatoes dozens of times just in the last few months. One day at work, after wrestling away some oven space, I decided to roast sweet potatoes for a lunchtime salad. Honestly, it was mainly because another cook had laid claim to nearly all the potatoes left in the kitchen. With some doubt as to what kind of salad I would concoct, I forged ahead and got to work dicing Granny Smith apples. To keep them from browning simply add them to a bowl of acidulated water (fancy talk for water and lemon juice) until you are ready for them. 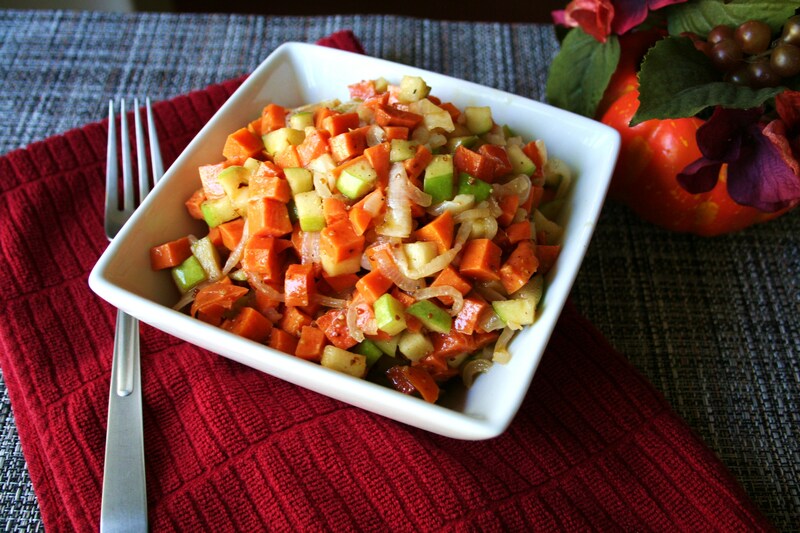 I got some rave reviews, and started making this roasted sweet potato and apple salad about once a week. Combining apples and sweet potatoes is not ground breaking, and no, this salad is not fancy or difficult to make, but sweet roasted brown sugar sweet potatoes and raw, crunchy, tart apples harmonize with the honey-mustard dressing in a way that will make your taste buds tingle. I later added the onions, experimenting with caramelizing them and with oven roasting them. I favor the roasting because they hold their shape better. For a bolder touch, try adding some red chili flakes. I hope that this holiday season you will give this recipe a try and let me know how your family liked it. In a large mixing bowl, combine the sweet potatoes, brown sugar, and cinnamon. Add the oil and toss to coat the sweet potatoes. Evenly spread the sweet potatoes on a large baking sheet in a single layer. Roast in the oven until the sweet potatoes are cooked through, about 20-30 minutes depending on your oven. Once the sweet potatoes (and onions) are completely cooled, toss them together with the raisins and diced apples in the large mixing bowl. Drizzle in the dressing and toss to coat. For dressing:In a medium mixing bowl combine the mustard, honey, and vinegar. Slowly whisk in the oil to emulsify. Season with salt and pepper to taste.